Dead branches, poor leaf color, could this be banded ash clearwing borers? Last week we met an exotic invader, the emerald ash borer. This hombre poses a real threat to our ash trees (see The Green Menace, Emerald Ash Borer). This week we meet a different and less serious pest attacking ashes called the banded ash clearwing. Banded refers to the yellow stripe on its abdomen and clearwing tells us that the wings are, well, clear, that is, not covered with scales like other moths. While the emerald ash borer can kill a tree lightening fast, in the span of a year or two, the banded ash clearwing kills ashes slowly over the course of many years or even decades, if at all. Ashes at greatest risk are those planted in stressful places such as along streets or in landscape islands in parking lots. Recall that the emerald ash borer is a beetle. Sawdust-like frass is a good clue that banded ash clearwings are at work. By contrast, the banded ash clearwing is a member of the moth and butterfly clan. The adult stage of this pest is a beautiful moth. It mimics the appearance of a stinging paper wasp and in so doing likely gains protection from predators that might like to dine on a tasty moth but would avoid a mouthful of stinging wasp. How clever. Adult banded ash clearwings began emerging from the trunks and large branches of ash trees during the past week or two. After taking wing, the female moth releases a pheromone or chemical signal into the air. This signal alerts ever-hopeful males in the vicinity that a mate awaits. After she mates, the female moth deposits tiny eggs on the bark of ash trees. The eggs hatch in a matter of days and the caterpillars known as clearwing borers tunnel through the bark and eat the nutritious tissue beneath. Larvae grow and develop during the remainder of this autumn and all of next spring and summer and consume ever-increasing portions of living tissues beneath the bark of the tree. The clearwing moth leaves behind a papery pupal case when it exits the tree. The cumulative affect of many borers over a prolonged period of time results in irreversible damage that produces symptoms such as a thin canopy with many dead branches, yellow rather than dark green leaves, and unusual, rapidly growing shoots called water sprouts at the base of the tree. If left unchecked, borers may kill the tree. Many of these symptoms are familiar because they are associated with other pests such as the emerald ash borer and some agents of disease, but the banded ash clearwing produces other signs that are quite unique. These clues are very useful for separating this pest from the more dangerous emerald ash borer. First, as banded ash clearwing larvae bore beneath the bark and reach maturity toward summer?s end, they expel shavings and excrement called frass from their galleries. This frass looks like sawdust and accumulates on the bark near the galleries and on the ground beneath the tree. 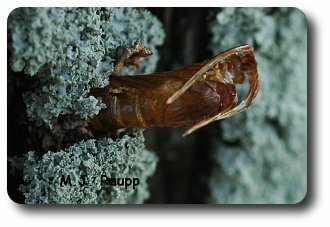 When the clearwing borer moth completes its development and emerges from the tree to fly and find its mate, it leaves behind a papery brown pupal case protruding from the exit hole on the bark. These pupal cases remain in place for several days until wind or rain cause them to fall. 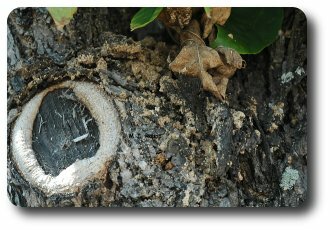 The hole in the bark from which the banded ash clearwing exits the tree is round or somewhat oval unlike the ?D? shaped exit hole of the emerald ash borer. A round or oval exit hole is a sign that clearwing borers not emerald ash borer are in your tree. For further comparisons of banded ash clearwings and emerald ash borers you can visit the following web site. http://www.dnr.state.md.us/forests/forester/eab.asp. Another species of clearwing borer called the lilac/ash borer may also attack your ash trees. Its life story and appearance are much the same as the banded ash clearwing except that adults emerge and lay eggs in the spring and early summer rather than the autumn. If you suspect the borers in your ash are not banded ash clearwing or lilac/ash borer and fear that emerald ash borers are present, please visit the Home and Garden Information Center web site at http://www.hgic.umd.edu/ content/emeraldAshBorer.cfm They have phone numbers for the EAB task force at the Maryland Department of Agriculture and an electronic form to report your sighting. The banded ash clearwing is relatively easy to manage if you discover it in your ash tree. You may enlist the aid of a certified arborist to help you deal with this pest. Reducing plant stress by giving your trees plenty of room for the roots to grow, keeping trees mulched a depth not more than 2 inches, and watering them in times of drought may help your trees defend themselves from attack by these and other pests. To learn more about banded ash clearwings and emerald ash borer, please visit the following web sites.